We have seen a long period of dry weather with very little rain or moisture in the South and East of England which has meant that local authorities have been forced to cancel football matches following the late summer drought as the ground is too compact. It will require only a modest level of sustained rainfall to render sports pitches unplayable. This is because the water cannot percolate down and reach the drainage system. 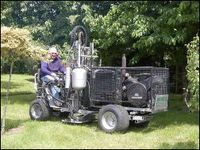 Aeration is the solution - but penetration is not easily achieved by many ‘top surface’ machines. A turf care professional does not need to leave it to luck when dealing with the weather and how the ground that he cares for reacts. By taking core soil samples and analysing the soil structure it is possible to plan your maintenance regime easier using the right information with far better results. Our soil samples, which are encased in a one metre plastic tube can serve more than one purpose when used as a soil analysis technique. Firstly the soil layers are visible to the full one metre depth that the probe operates allowing anyone to see the profile of the soil beneath the turf and how it may have been treated or what might be causing restrictions. "Conditions this year have been very difficult for us. Ours is a destination course and people travel from around the world to play here. If they get up in the morning and find the course is closed, we risk ruining the memory of their trip." These are the comments made by Loch Lomond golf course supervisor David Cole after another year of torrential rain and miserable weather forced course closures around Scotland. Bookings are down due to the weather and greenkeepers have been struggling to keep venues open because conditions have been so bad. When you drive up to view the show home on a new estate it appears that all of the stops have been pulled out on the landscaping front and the garden looks as though it has been established for ten years or more. The lawn is lush and green and all of the shrubs and trees look large and healthy specimens. Sadly, after you have signed on the dotted line and paid the developer his whopping fee for your dream home things change quite rapidly in the garden of your new home. The shrubs are stunted and barely in the soil, lumps of brick and plastic are visible in the borders and the grass is yellow and threadbare.